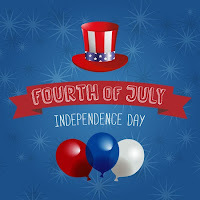 ESL Made Easy: July Topic: Independence Day! Tuesday, July 4th is Independence Day in the United States. Also known as the Fourth of July, this date commemorates the Declaration of Independence from Great Britain. This is a festive day for many Americans as they celebrate with fireworks, parades, fairs, concerts, picnics and family reunions. It's a fun and proud day for Americans so get your students talking about the history, the culture, and the traditions of the United States! FIND RECOMMENDED LINKS FOR YOUR ESL STUDENTS HERE!